A steaming cup of coffee, a soft drizzle outside and these pictures to edit. This blog post is the first one that really makes me feel like I am bringing fall to the blog. We stumbled upon this location by chance this morning. We had to run a few errands in the city and found this abundance of color near the parking lot. I loved it aaaand apparently was toting my camera around. Two times lucky, but since we didn’t have much time I had to sacrifice the vanilla latte I had just gotten. Much like color there were blogger problems in abundance, because when I was going through the photos I noticed the wooden stir stick was still in my pocket. But you can’t spot it, can you? 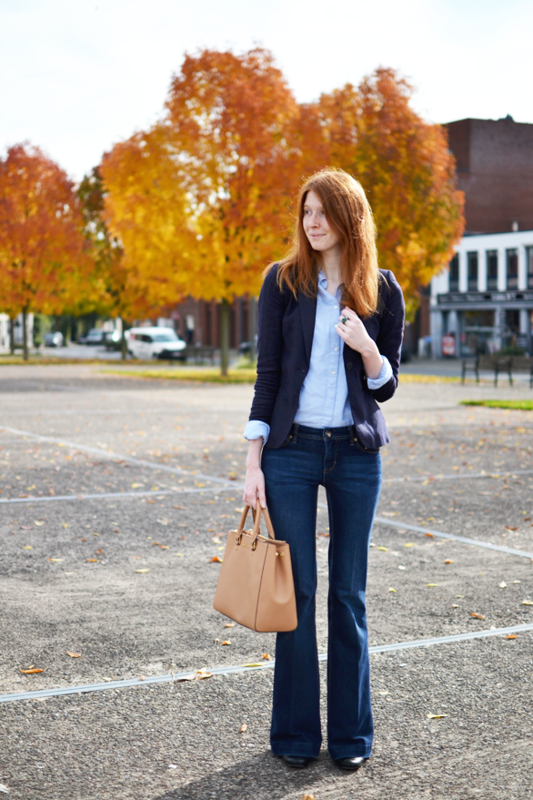 I’ve had this blazer since high school, the shirt is from London three years ago and the first time I wore the wide-legged pants on the blog apparently was in the fall of 2012. Somehow it took about three years for me to add all of the ingredients together and create this, in my humble opinion, epic look. I just love how these jeans make me feel and a blazer always makes me feel badass so this outfit is a total winner for me. It’s formal, but the jeans and tan colored bag are a nod to the current seventies trend making the outfit very fall ’15. Last week I wore an outfit featuring my new sweatpants (yes, I bought a pair!) and a comfy knit cardigan (yes, I caved!). I’m planning on wearing it again this week and hopefully get pictures taken. The weather is said to be taking a turn for the worse, so I’m keeping my fingers crossed (another one of those #bloggerproblems), but if I can get it on the blog next it will be quite the contrast with this look, haha. Hope you guys had a great weekend! We went to Ikea and I’ve been building MALM stuff the whole time. Our bedroom is coming together nicely, but I cannot find any bedside lamps that resemble the Marks & Spencer ones we’ve fallen so madly in love with. Any tips? LOVE this look! And the colors of the trees behind you is absolutely beautiful! The weather here has definitely been giving me #bloggerproblems too! I understand the struggles. I’m also super jealous of how pretty the trees are where you are. They haven’t even started to change color here yet! Also this outfit is so classic and perfect. These jeans look amazing on you. All the pieces pair together wonderfully. You are such a babe, that first photo is the best your hair is amazing! Pinning this outfit stat! It’s chic and classic and feminine and I love it! 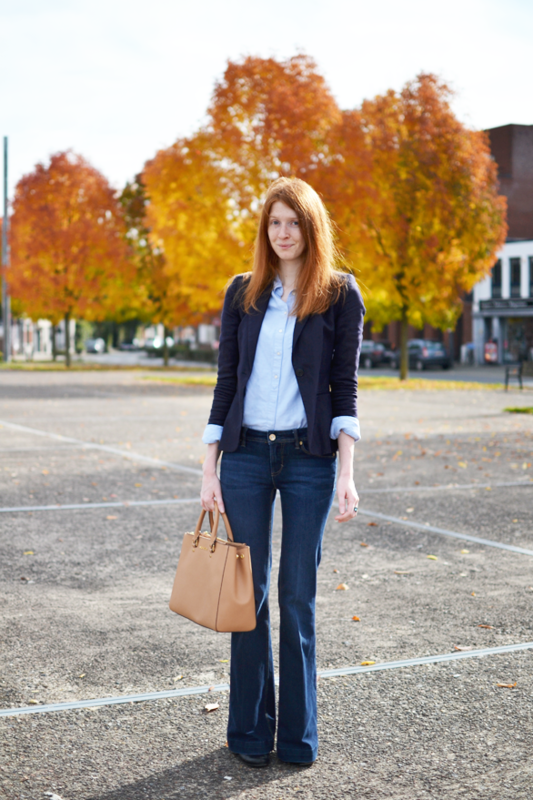 A perfect autumnal look, and those jeans make you look miles long! And no, I can’t spot the coffee stir. Gorgeous! Supermooie look en background! Echt een geweldige look van jou 😀 en met de bomen op de achtergrond helemaal af! Zo’n broek kan je echt goed hebben! Ah! I love this outfit so much. The length of the flare jeans is just perfect.